Tri Mountain Micro Fleece Jacket - 7450C Frontiersman Camo [7450C Frontiersman Camo] - $84.35 : Sogowear Outfitters!, Polo Shirts, Golf Shirts, Jackets, Fashion Fleece, Woven Shirts and More! 10.2 oz. 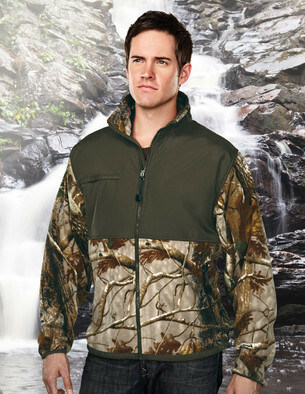 heavyweight 100% polyester anti-pilling micro fleece jacket. Featuring olive nylon panels on the front and back yoke, back forearms and along the bottom. Accented with chest and side zippered pockets, elastic-bound cuffs and the EmbAccess™ system for clean embroidery. Adjustable drawstring bottom with cord locks provides a custom fit. Slight drop tail.